A BBC documentary about the Tibetan, Nepali and Kalmyk languages is what inspired sound designer Ben Burt to come up with a language for the Ewoks in the Star Wars series. Burt decided to make the Ewoks speak in Tibetan language. The Ewoks are teddy bear like characters that live in a forest. They are a fictional species of primitive creatures who brought down a technologically advanced empire. Ewoks were first featured in Star Wars: Return of the Jedi. They have since then been featured in other television series such as Ewoks: The Battle for Andor and other animated series and books. Kalmyk is the native language that is spoken by the Kalmyk people of Kalmykia in the Russian Federation. According to UNESCO, the Kalmyk language is endangered, as only a small population of the Kalmyk people can now speak the language eloquently. There are several reasons that led to the decline of the language. The major reason was the deportation of the Kalmyk people in December 1943 from their homeland as it was alleged that they had colluded with the Nazis. During the deportation, a lot of people died on their way to exile and when they reached exile as a results of sickness and malnutrition. Also, there was a lot of stigmatization against the Kalmyk people, which led to many of them maintaining a low profile. The geographic distribution of the people and the integration into other cultures led to the demise of the language by the time they were allowed back into the Russian Federation in 1957. In addition, the Kalmyk language was no longer used as a primary means of instruction in schools as Russian became the official language of the Republic of Russia. The Kalmyk language is also spoken in the USA, France and China. The actual number of people who speak the language is unknown. The Cyrillic alphabet is used when writing. The Kalmyk language has been influenced and adopted words from other languages such as Russian and the Turkic languages. The Kalmyk language is closely associated with the Oirat dialects which are found in China and Mongolia. 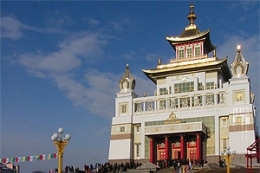 Kalmyk is also known as Kalmuck, Weilate, Oirat, European Oirat, Xinjiang Mongolian and Western Mongol.